Harry Ramsden is the most famous name in fish and chips across the world. There are over 40 restaurants in Britain. Harry Ramsden (1888 – 1963) was the son of a fish and chip shop proprietor in Bradford, Yorkshire. He worked as a taxi driver and as a publican before enlisting in the army. After leaving the army in 1918, he set up a small fish and chip shop of his own. After several successful years in Bradford, Ramsden was advised to move to the countryside for the health of his tubercular wife. He borrowed £150 to buy the property and equipment of the Silver Badge Cafe at White Cross, Guiseley in 1928. A former army hut, the wooden building measured just 10 x 6 foot, however the location was next to a tram terminus used by tourists to the Yorkshire Dales and the Lake District. Ramsden borrowed £400 from his wholesale fish suppliers to buy the surrounding wasteland. Ramsden built a large 100 seat restaurant in 1931, in an attempt to take his classic working class dish upmarket. Takings were £7,825 in 1937. £5,104 of sales were taken in the first class restaurant, and £2,721 were taken by the second class restaurant and take-away sales. Local mills and factories lacked staff canteens, and would often dispatch a member of staff daily to collect lunch from Ramsden’s. Ramsden’s nephew, Harry Corbett (1918 – 1989), the creator of the Sooty and Sweep puppets, would occasionally entertain diners with his piano skills. Ramsden was being chauffer-driven in a Rolls Royce by the 1940s. Ramsden could tell if the frying oil was hot enough by the sizzle that the chips made when they entered the pan. Chips were cooked for three to three and a half minutes, depending on the type of potato, and fish was cooked for five minutes. He claimed not to know the recipe for his batter as it was supplied to him in powder form by a Leeds company. The Yorkshire Post described Ramsden’s as “the most famous fish and chip restaurant in Yorkshire” in 1952, and it was one of the busiest in the world. The restaurant car park could hold 200 vehicles. The success of the venture was based on a great location and Ramsden’s hard work, perfectionist commitment to quality and his flair for marketing and showmanship. It was reported in 1952 that Ramsden had sold the business for £35,000 to William Mark Kirby, a fish and chip restaurant proprietor in Grantham. However at the last minute, Kirby pulled out of the deal. Ramsden decided to enter semi-retirement, and to mark this, he sold fish and chips for one day at the one and a halfpenny price his father had sold it for in 1912. 8,000 people were served, including over 2,000 in a single hour. Ramsden sold the restaurant, with 94 seats and a staff of twenty, to Eddie Stokes (born 1917), an experienced caterer, for £37,500 in 1954. Ramsden died in 1963 and left an estate valued at £44,177. Like Ramsden, Stokes believed that quality pays, and he maintained a high attention to detail. He installed Bohemian cut-glass chandeliers, stained glass windows and replaced the linoleum floor with wall to wall carpeting. There were fresh flowers and linen tablecloths. Batter was mixed by hand for 30 minutes. The Sunday Times reported in 1965 that were queues to get into the restaurant every day. Deliveries of fish arrived daily; 85 percent haddock, ten percent halibut and five percent plaice. The restaurant employed 100 people. By this time the restaurant had a listing in the Good Food Guide. Stokes sold Ramsden’s to Associated Fisheries, who owned eight Seafarer fish and chip restaurants in London, in 1965. The restaurant was expanded in 1969. Stokes remained as managing director of the restaurant until his retirement in 1970. 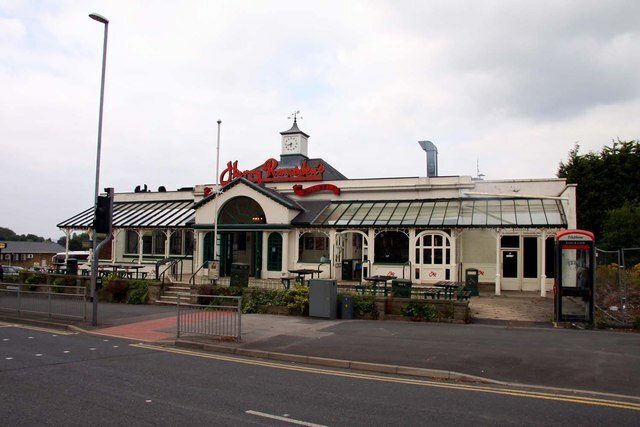 The Sunday Times described Ramsden’s as the largest fish and chip restaurant in the world in 1971. By this time it had 186 seats, 150 staff and parking for 400 cars. That year 1.5 million people were served and sales amounted to £300,000. In 1974 the restaurant used 400,000 lbs of fish, 100,000 lbs of beef dripping, 900,000 lbs of potatoes, 9,000 pints of vinegar, 20,000 bottles of sauce and 26,400 loaves. Margaret Thatcher visited Ramsden’s in 1983. Somewhat embarrassingly, the Prime Minister and her entourage forgot to pay the bill before they left the establishment. Harry Ramsden’s was acquired by John Barnes for £3 million in 1988. He believed that the Ramsden’s brand was under-developed. He signed a deal with United Biscuits to produce Ramsden’s branded foods. Barnes began to build the company into a chain of restaurants. The company went public to fund expansion overseas from 1989. The first international franchise was a 200-seat restaurant in Hong Kong. Controversially, Barnes replaced beef dripping with blended vegetable oil, and fresh fish was replaced with frozen fillets. Ramsden’s was acquired by Granada for £20 million in 1999. Compass, who had merged with Granada, sold the chain to EQT in 2006. Ranjit Boparan acquired Ramsden’s for £10 million in 2010. The Guiseley outlet became loss-making, and it was closed down in 2011. The site was acquired by Wetherby Whaler, a local fish and chip restaurant company.